This would not be my first trip to California, but it had been some time since setting foot inside the Golden State. One of the fringe benefits of working at the Grand Canyon was an opportunity to explore the Southwest either through trips offered by the employee rec center or independently. The group from Singapore had planned an impressive tour of the US before returning home — Las Vegas, LA, San Francisco, Yosemite and New York. I requested to tag along for the LA part, provided I could get there. This was part of the challenge and, as most travel agents will tell you, part of the fun. Since noticing the Amtrak station in Flagstaff, I had been intrigued by the train and what it was all about. Rail passenger service in the South is almost nonexistent. Hurricanes have decimated tracks along the Gulf Coast and the states there seem to have no interest in restoring routes. Most of the poor and those without a vehicle travel primarily by bus in the South. Having experienced Greyhound before, I was in no hurry to ride the dirty dog again. So in figuring out the way to LA, I decided to take the Grand Canyon train to Williams, Arizona where I could connect to Amtrak’s Southwest Chief and ride into Los Angeles just before dawn. It would be around a 15-hour trip and luckily I would not be making it alone. Joel, one of the Singapore entourage, would travel with me while the others went ahead to Las Vegas. Joel’s work contract called for him to stay a few more extra days in the Canyon and although he was not happy about it, he honored the deal and consequently missed out on the Vegas portion of the group’s American adventure. Of all the Singapore guys, Joel had the most uninspiring Grand Canyon job. He was a kitchen utility worker at Yavapai Lodge, where he cleaned cafeteria tables and loaded dishwashers. “So much wasted food,” Joel would grumble when I asked about his duties. He cheerfully added, he would get me all the soda I could want when I was in the cafeteria. One of the few perks of his job. 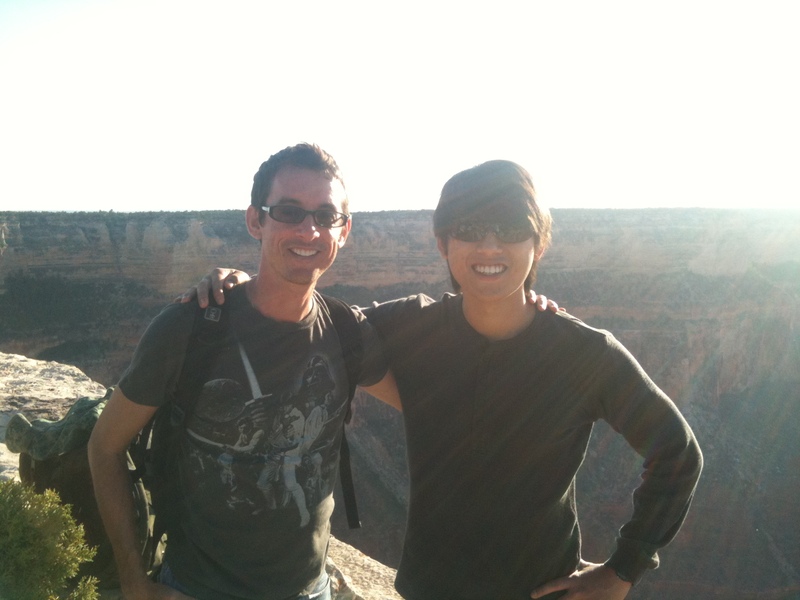 I had gotten to know Joel better one afternoon when we hiked up the Hermit’s Nest Trail to watch a rare solar eclipse. A fierce soccer player, Joel described his matches as if they were all out war and revealed he was often at odds with his coach. He was also quite the romeo and not long after arriving in the Canyon, Joel began dating a cute Thai girl from housekeeping. As the solar eclipse got closer, it was Joel who found an awesome spot to view it. We climbed down from the rim — beyond the guard rail — and settled on a flat column of rock just past Hopi Point. A solar eclipse occurs when the Moon passes between the Earth and the Sun and essentially creates a “Ring of Fire.” We had equipped ourselves with special viewing glasses and from our vantage point overlooking the Colorado River and the many chasms of Grand Canyon, the eclipse was indeed an awesome sight to behold. But staring too much into the sun is never a good thing. As we posed for pictures afterward, I remember Joel stumbling and damn near falling into the Canyon. I don’t think even he realized how close he had come to certain death. Traveling by train to LA would be much less risky. As employees, the train ride to Williams was free, but it sure wasn’t fast. On average a 45-minute trip by car turned into a 2-hour slow descent through barren land. Joel had made the trip before, taking his girlfriend to Williams for an overnight excursion. He knew what to expect, right down to the super corny staged “holdup” by wild western outlaws. The entire train ride was geared toward children and families. We were merely taking advantage of our employee status and thus endured stale jokes for the free lift. I did not dispute any of Joel’s observations and served more less as his therapist when he told me how, on his last day, he had basically told this one older Indian woman to take a long walk off a short pier. After dinner, we returned to the train depot where a bus waited to take us to the Amtrak station, a few miles south of Williams. But as we would find out, there was no station and no train in sight. Really well written John. Love the hook at the end. You’re killing me! Next installment , PLEASE! Well, at least you got a good meal out of the deal. BTW, when you say “ring of fire,” do you mean an annular eclipse? Yes, Don. Annular is the correct term. Thank you and the food was delish.